October is here, which can only mean one thing: time to purchase some yellow hearty mums. 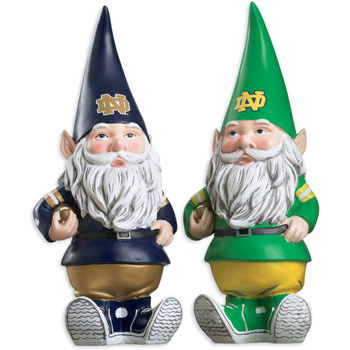 Failing that, I should at least look into picking up a few Fighting Irish gnomes ($25) to inhabit the garden. The advantage of these little guys is that you never need to water them. The disadvantage is that it puts a target on your back during losing seasons. Only the strong dare to purchase the gnomes. This entry was posted in Notre Dame, outside stuff. Bookmark the permalink.